NES Contra (JPN) "pacifist" in 09:46.38 by adelikat. 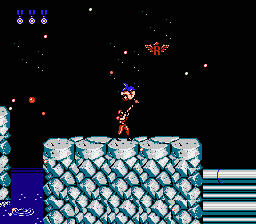 Contra completed fast with one distinct goal: do not kill, unless absolutely necessary to complete the game. This movie is 46.95 seconds faster than the preceding version due to better boss fights, a jumping glitch in lv 3, and the use of the spread gun. The ROM change counts for about 27 seconds of the improvement. Also, the author better achieves the pacifist goal by not killing the level 5 tanks costing about 9 seconds.